The Red Sea, ‘Al Bahr Achmar’ in local parlance, is the result of a graduable separation of the African and Arabian tectonic plates. These tectonic plates are still moving by the way, at a staggering speed of about 2,5 centimeters per year. In fact, the Red Sea is ‘an ocean in the making’. The Red Sea, its water salty and warm, is ‘blocked off’ by the Sinai Peninsula, which divides the northern part in the Gulfs of Suez and Aqaba. The Suez Gulf is relatively shallow with a relatively flat floor. The Gulf measures approximately 250 kilometers and is some 32 kilometers across. In contrast, the Gulf of Aqaba is narrower and 150 kilometers in length and far deeper. This Gulf comprises two depressions, one to the north and one to the south, respectively 1100 meters and 1420 meters in depth. Its deepest part is in the eastern region with an impressive 1800 meters in depth. From the north, at the Sinai Peninsula, the Red Sea spans out to reach a maximum width of approximately 350 kilometers. She narrows down to only 25 kilometers at the Strait of Bab-el-Mandab to finally turn into the Indian Ocean. From a diver’s and physiograpic perspective, the Red Sea distinguishes three ‘regions’. There’s the coastal region that is as much as 500 meters in depth, an intermediate region whose lowest parts reaches more than 1000 meters; and finally the deepest part along the axis of the Red Sea, measuring up to even 2000 meters. The shallower coastal region is certainly the most intriguing from a diver’s point of view. Here we encounter varied coral reefs in abundance. The Red Sea coral reefs are categorized as ‘fringing’ reefs. They can range in width from a few meters to even about 1 kilometer. Their summits often break the choppy waves of the Red Sea at low tide. There also other coral formations in the Red Sea. Their continual growth has kept pace with the rising sea level, making for appearances in the shape of coral islands and barrier-like reefs. The Red Sea fauna is simply incredible in terms of variety, colour, exceeding over 1000 species of fish. About 10% of this number is categorized as ‘endemic’. It means they can only be spotted in the Red Sea. The majority of these species are butterflyfish, belonging to the Chaetodontidea family. The Red Sea is the habitat of two major groups of fish. They are the reef fish and the pelagic fish. It will come as no surprise that reef fish roam the area around coral reefs. They are of the smaller and medium-sized type and characterized by bright and vibrant colours. Reef fish feed on plankton, some are herbivorous, whilst others are carnivorous or omnivorous. In the Red Sea we see about 300 different species of reef fish. Some are solitaire, which means they live alone. Others operate in small colonies or large schools. Certain species of reef fish are known to associate with either soft or hard coral formations. Pelagic fish like to roam around in open water. Although there are exceptions, these are predominantly carnivorous. In order to find food they approach the outer edge of coral reefs only. There’s another division within the categories of both reef fish and pelagic fish. Reef fish and pelagic fish can have diarnul and nocturnal habits. It means they are active either during the day or during the night. The wonderful world of the abundant Red Sea fauna knows no boundaries or limits. The tropical waters of Egypt are closest to the European continent and have been an ideal destination for tens and tens of thousands of divers for many decaded from all around the world; and all-year round. Cities like Hurghada offer a wide range of sophisticated and well-equipped diving centers, allowing divers to enjoy the wonderful flora and fauna of the Red Sea. 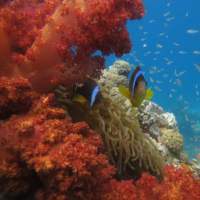 With the influx of scuba tourists, potentially having an environmental impact, guidelines have been set out for protection purposes of the waters of Egypt. In order to contribute to the conservation of the Red Sea’s unique and complex ecosystem, each visiting diver should observe the greatest care and respect. Each diver and snorkeler can help protecting our swimming friends and contribute to sustainable aquautic Red Sea tourism by acting with plain common sense on a diving or snorkeling trip. It’s in everyone’s interest to preserve continuity of the quality of life of the Red Sea, enabling all divers and snorkelers to appreciate the beauty and grace of the lora and fauna for now and for many years to come. Having said that, let is now dive into the wonderful world of the Red Sea fauna!